Philipponnat, founded in in Mareuil-sur-Ay in 1522, is best known for their superlative Clos des Goisses, a rare single vineyard Champagne and one of the best Champagnes, period. Clos des Goisses is a 5.5 hectare walled vineyard situated on an extremely steep south facing hill (30 to 45 degrees steep!) facing the Marne canal in Mareuil. The quality of their other wines has varied, although since 1997 when acquired by the Boizel Chanoine Champagne Group (now the Lanson-BCC group), their quality has greatly improved. Champagnes are Pinot Noir based and powerful but always fresh tasting and contain a minimum of 30% Chardonnay. The Pinot Noir is from Aÿ, Avenay, Mareuil sur Aÿ, and Mutigny in the southern Montagne de Reims which they own. Chardonnay sources include long term agreements with growers in the Cote de Blancs. No malolactic fermentation and a moderate dosage help increase the impression of freshness. Reserve wines are blended Solera style. Royale Réserve NV - 65% Pinot Noir, 30% Chardonnay 5% Pinot Meunier and 20 to 40% reserve wines. Royale Réserve Non Dosé - same as the Royale Réserve but with no dosage added. Reservee Rose - 70% Pinot Noir, 25% Chardonnay and 5% Pinot Meunier with 7 to 8% still Pinot Noir wine added and 20 to 35% reserve wines added. 1522 Vintage - Both a Grand Cru white made from 60% Pinot Noir from Ay and 40% Chardonnay from the Oger in the Côte des Blancs, and a Premier Cru Rose made from 55% Pinot Noir from Ay, 40% Chardonnay from the Côte des Blancs, and 5% still red Pinot Noir from Mareuil sur Ay. These are low dosage wines and aim for intensity instead of strength. See the tasting note below. Sublime Reserve Vintage - a slightly sweet (sec, with 30 grams per liter dosage) Blanc de blancs. Réserve Millésimée Vintage - made from 70% Pinot Noir from Ay and Mareuil-sur-Ay and 30% Chardonnay from the Côte des Blancs, low dosage, with 6-7 years of aging before release. The disgorgement date is on the back of each bottle. Tasting Note: Philipponnat Reserve Millesimee 2002 - May, 2012. Rated B+, almost A-, and may improve with time. Nose: Crisp green apple, mint, minerals. Sweaty gym socks like a great white Burgundy (this is positive) which becomes a creaminess as it warms. Chalk. Palate: Ripe apple, lots of minerality and earth tones. Creamy with chalk, minerals, and lime tones near the end as it warms and opens. 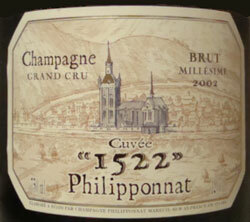 Tasting Note: Philipponnat 1522 Vintage (Millesime) 2002 - Dec 2012 - rated A-/A - it's a baby now. and will only get better. Nose - Immediate fresh cut Macintosh apples, minerals, nutmeg, a chalky mintyness. Spicy orange rind and pineapple as it warmed. A very round and full mouthfeel. Creamy. A touch of sweet apple juice. Guava and mango as it warmed. Both the nose and palate become more and more about minerals and tropical fruits as this warmed and breathed and I liked it more and more. Wish I had a few bottles in the cellar to see how they evolve!